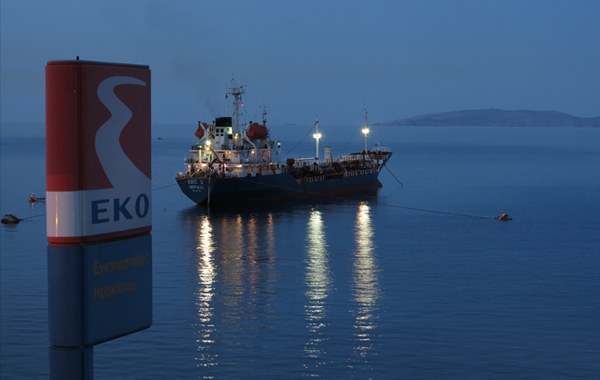 The Heraklion facility is located in Linoperamata, in Herakleion Crete, on three adjacent privately-owned plots (ΕΚΟ Ι: 10,500 square meters, ΕΚΟ ΙΙ: 10,800 square meters, and Hellenic Fuels: 13,200 square meters). The total storage capacity of the facility in Crete is approximately 27,000m3 and the daily distribution capacity with tanker trucks is more than 1200m3 of fuels, over an 8-hour operation during the winter months, and 2400m3 of fuels during the summer. There are 19 permanent employees on-site. There is a total of twenty two (22) ground and aviation fuel tanks. Refueling takes place with tankers through three separate mooring piers in the bay of Linoperamata and a system of subsea 6’’ pipes, about 800 meters long, that connect the piers with the onshore premises, at a speed of 200m3/hour. The tankers that can be accommodated in these mooring piers have a total tonnage of up to 3.500 DWT, with the option of stern unloading. Loading of tanker trucks takes place in fully automated bottom loading systems, at a speed of 120m3/hour for up to 4 products simultaneously, with an automatic additives injection set-up during loading. The facility has Vapor Recovery Units, state-of-the-art pumping stations, and fire extinction water tanks, while it fully complies with all corporate health and safety regulations, and meets the requirements of the environmental legislation. More specifically, the facility of Hellenic Fuels is environmentally certified by ISO 14001. The facility serves the supply needs for ground fuels in the 4 prefectures of Crete and also for aviation fuels for the airports of Heraklion, Chania and Sitia.